Canalys released its fourth quarter stats and it was another big three months for Google's open source OS, Android. Of the 216.5 million smartphones shipped worldwide from October through December, a whopping 69% were Android flavored. Of the 438.1 million units shipped of all handsets, including featurephones, 34% of them were Android and 11% were powered by iOS. Speaking of the entire handset market, shipments were flat year-over-year, while those for smartphones rose 37%. Smartphones made up nearly half of all handsets shipped. With 62.9 million units shipped in the quarter, Samsung was the top OEM for the period with a 29% share. 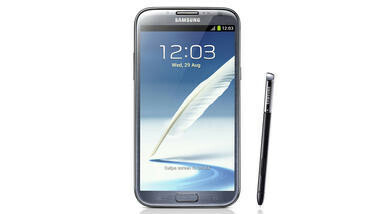 Two phones, the Samsung Galaxy S III and the Samsung GALAXY Note II have been in demand, helping the manufacturer to achieve its share. With a 22.1% slice of the global smartphone pie on the fourth quarter, Apple finished second. Chinese smartphone producers Huawei, ZTE and Lenovo surprisingly rounded out the top five. There was a big gap between the 47.8 million phones shipped by number two Apple and the 11.8 million shipped by Huawei, which was number three. Lenovo edged out Sony to place in the top five and had remarkable growth of 216% over Q4 of 2011. 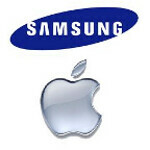 For the year, Samsung finished on top, besting Apple by 74 million units with Nokia third. 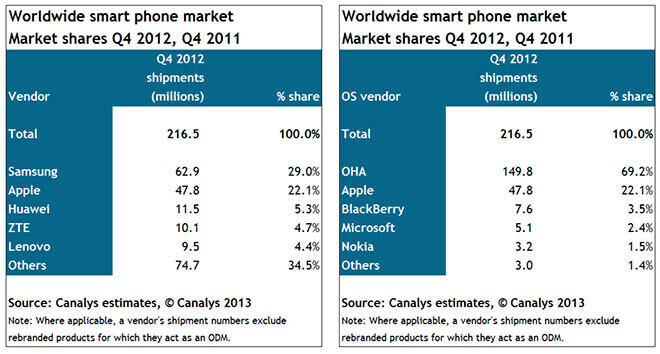 After the 69.2% of the global smartphone market in Q4 2012 that belonged to Android, iOS was next with 22.1%. There was a big drop after that with BlackBerry and Microsoft making up 3.5% and 2.4% of the market respectively. That leaves Nokia on the bottom of the top five with a 1.5% share. Samsung is doing it big. sammy is the father of all phone manufacturer now. Steve Wozniak already said it... Apple is GOING DOWN!!! Do you need another hint? Perhaps a lighting strike on your head? That's very much unrealistic dude. You can't expect Apple to go down THAT fast. In fact, it would take QUITE A LOT of CEO mistakes (Stephen Elop at Nokia, I'm looking at you) for a company as successful as Apple to go down drastically. I'm not saying that there are no indications of trouble inside Apple but that's just way too pessimistic. Microsoft, Blackberry and Nokia ??? Are you comparing OS or Phone Manufacturer ?? Nokia is producing Symbian and Windows Phone. This article does not make sense at all. Well well.. Microsoft 5.1 million phones. Wow. That's just lower than even I have expected. Thats THIRTY TIMES LESS than Google did! Lmao. All those Lumia 920 sold out stories become much clearer now - it's a low volume trick done by Nokia. The demand was obviously still high, but with unlimited supply I don't think it would sell more than 4 million units. you mean like the nexus 4 (lg only manufactured around 400,000 units in total) or the blackberry z10 ?? ?